Do you deliver at weekends? / Can I choose my delivery slot? Our deliveries take place between 8am and 6pm Monday to Friday. While we attempt to accommodate Customer requests we are not able to offer customers the ability to choose the specific date and time of their delivery. If a customer is unable to accept delivery on the date and time offered, we will where possible attempt to re-arrange delivery at a later date, when we have another vehicle in the vicinity. Ultimately you, as the Customer are responsible for ensuring that someone is available to accept and sign for delivery at your property on a date and slot specified by our staff. How much space is required to assemble beds? Approximately 10cm extra space is required when assembling our beds. For example if you are ordering a 183cm long bed, approximately 193cm of space is needed, 208cm for a 198cm long bed and so on. Please remember to measure from skirting to skirting when checking the space available and take into account any obstructions such as radiators and windowsills. Depending on the other space available in a room, more may be needed for Larger beds such as Sleepover Beds, Bunks and Study Units. Do you take deposits? / What payment methods do you take? At this time we do not offer deposits. 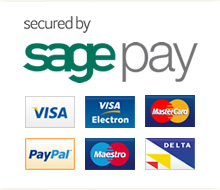 Full payment is taken at the time of placing your order, either online, over the telephone or at one of our stores. The following payment methods are accepted (subject to terms); Visa, Mastercard, Maesto (Switch), Delta, Paypal, Visa Electron and Visa Debit. What are products made of? Please see our General Product Information and Aftercare page for details on materials and specifications. What size mattress fits my bed? We have listed the bed measurements and the corresponding mattress sizes in the table below. A back panel is an optional panel which is positioned on the opposite side of the bed to the drawers and cupboards. There is a back to the drawer and cupboard boxes on our beds already, but a back panel offers a single piece which is more attractive to the eye to cover the space between the back of the bed boxes and the edge of the bed. If the back of a bed is to be positioned against a wall, a back panel would not be needed. At present we only deliver furniture and large items to mainland UK. It may be possible for us to ship smaller items such as accessories to other countries subject to fees and terms. Please contact our head office using enquiries@childrensbedcentres.co.uk detailing your specific enquiry. Spare parts for some products are available to purchase. For example headboards, footboards and doors and some smaller items such as drawer runners and magnetic catches. Please contact our head office at enquiries@childrensbedcentres.co.uk detailing your specific enquiry. How do I clean the products? Please see our General Product Information and Aftercare page for details on general maintenance and cleaning.